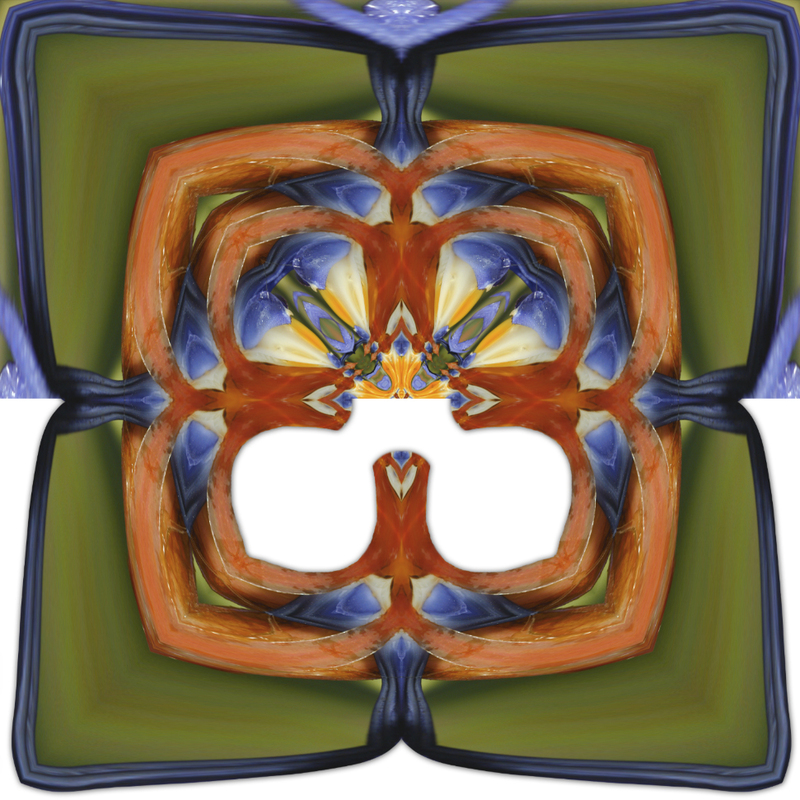 Every one of my kaleidoscopic artworks starts with a photograph. I’m going to use as an example the piece Bird OParadise. 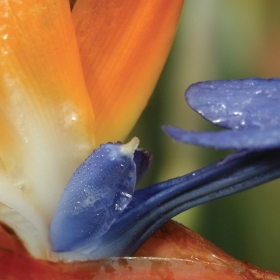 As you might have guessed, the subject is the bird of paradise flower. The sturdy purple and orange blossom shows up against a muted green background. They come together for a natural display of secondary colors. Pay special attention to the blue-violet flower petal speckled in dewdrops emerging from the structural flower’s beak-like sheath or spathe. 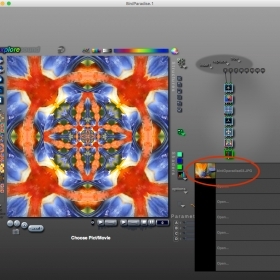 I import the base image into a graphic synthesizer program (ArtMatic) for manipulation. The photograph is filtered through a variety of mathematical transformations—stretched, bent and reflected through fractals, polar space and fun-house mirrors. Interesting results are saved as key-frames that can be rendered into large-scale graphic files. 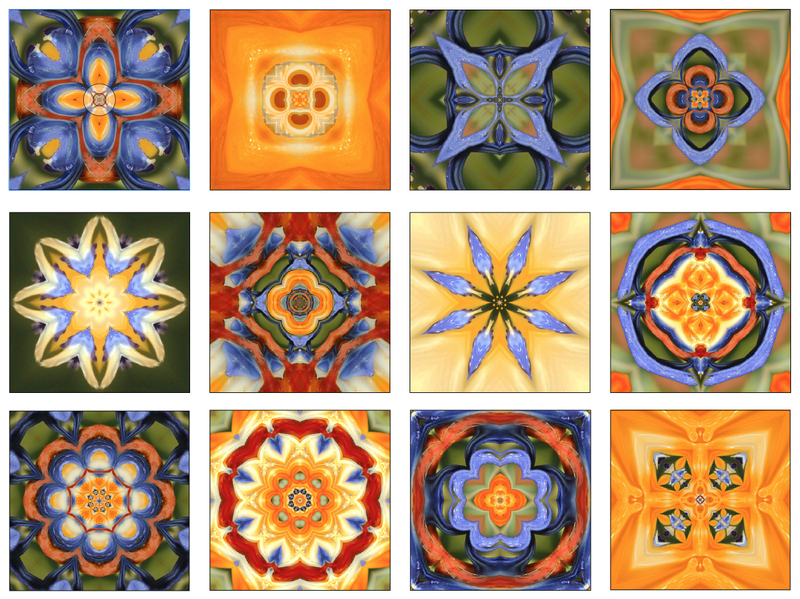 The key-framing process allows an image to be animated over time (videos) however, for this series, I only capture the still frames, instructing the software to render the kaleidoscopic reflections. I call the resulting images “foundlings.” I collect the foundlings and tuck them away in a folder, preparing for a digital collage. After creating several foundlings, I examine them in large scale—sorting, selecting and sometimes creating more, as the artwork requires. I prepare the selected foundlings in Adobe Photoshop using a technique called masking (think of a digital X-acto with a lot more control). I gather the masked foundling into layers and manipulate the light and shadow to enhance the illusion of depth in the finished artwork.